Last time I talked about how everything went so wrong. Now I’m here to regale you about how everything began to go so right. 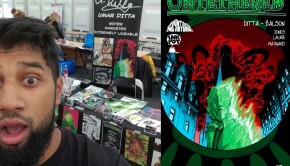 It’s fu­­nny that so many people know of the Teenage Mutant Ninja Turtles, but many of those same people have no idea it started out as an independent, black-and-white comic three years before the beloved cartoon series ever started. Eastman and Laird’s Teenage Mutant Ninja Turtles still remains the most successful independent comic of all time, but as I said in the previous article it went generally unnoticed for years, in the shadow of it’s more popular counterpart. The most recent TMNT comic was written and self-published by TMNT co-creator Peter Laird himself and never made any headlines. 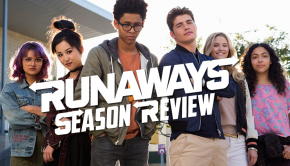 The series was still in production when Nickelodeon’s buyout of the franchise occurred, and is currently in hiatus. It’s not really known if the series will ever continue, as Laird still maintains the right to produce up to 18 Ninja Turtle comics a year if he wants to. When it was announced Nick bought the Turtles franchise, there was general fear that they would run it into the ground, or worse, just let it sit on the shelf and never touch it again. But to the relief of the fandom, they had a clear plan in mind from the start. They wouldn’t simply be doing a new cartoon, but they were going to push the Turtles back into the public eye through all different mediums. And just like back in 1984, it all began with a comic book. 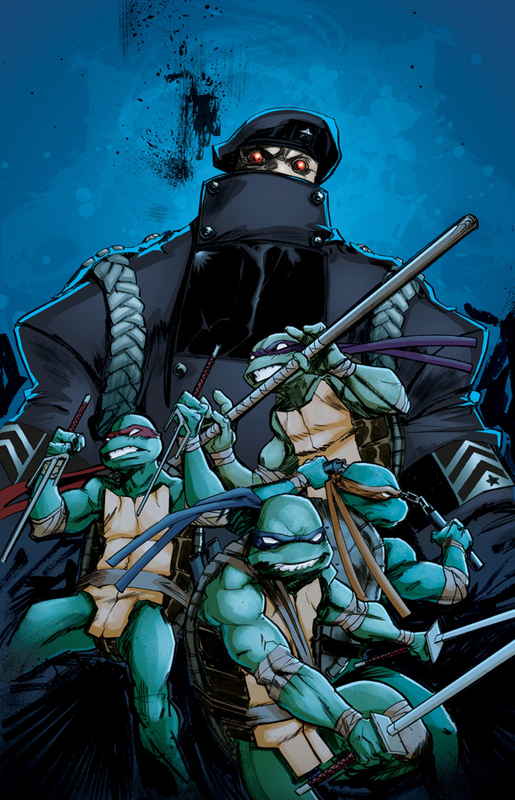 Back in April 2011, it was announced that IDW Publishing had acquired the rights to publish a brand new TMNT comic book series. IDW was known for producing comics based off licensed material such as G.I. Joe, Star Trek, Godzilla, and Transformers. 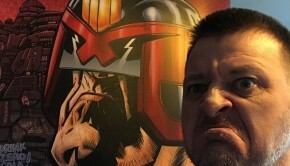 Now, IDW is nowhere near Marvel or DC in terms of popularity, but neither can they be considered really, independent. They’re certainly one of the more prominent secondary publishers, much bigger then Mirage Studios and much better equipped for marketing. Let’s put it this way, with IDW you didn’t have to print and fill-out a mail order form to get your comics every month and unlike before, people would actually know a TMNT comic existed. The new comic wouldn’t follow the continuity previously established by Mirage, (which now saw the Turtles in their 30’s, Raphael mutated into a hulking Gamera-looking Turtle monster, Master Splinter dead, April revealed to be a drawing brought to life, and other really weird stuff), but instead be a complete reboot of the franchise, taking elements from the original Mirage comics, the popular 80’s/90’s cartoon, and pretty much every incarnation of the Turtles and finding a way to spin it into something totally new yet completely familiar. At the helm, senior staff writer for IDW Tom Waltz, whose previous work for the studio included Silent Hill and Ghostbusters. Joining him in writing dutties, in a welcome surprise to every TMNT fan out there, was TMNT co-creator Kevin Eastman, who left the franchise in the early 2000’s to focus solely on the comic magazine Heavy Metal, which he’s the owner of. 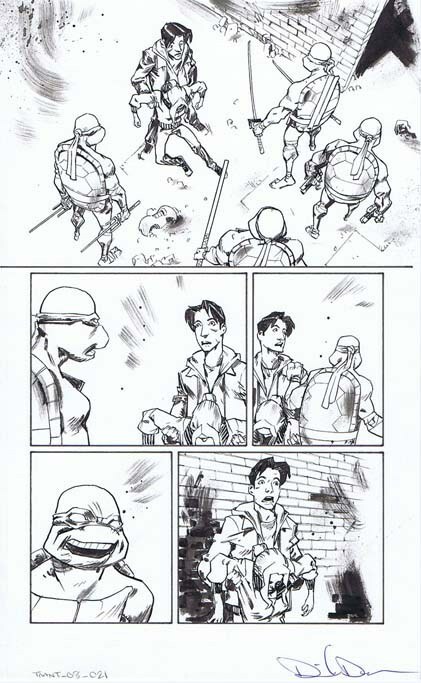 Having Eastman back on board was a welcoming sign for longtime fans, who’s last contribution to the franchise was 1996’s stand alone, hyper-violent Raphael and Casey Jones story, “Bodycount”. 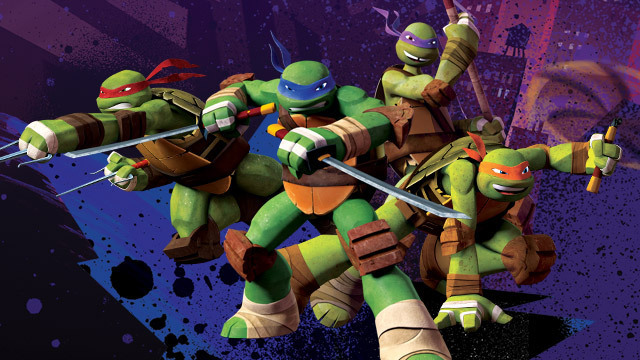 Throw in Dan Duncan on art duty and you’ve got the team that gave TMNT fans what they’ve been waiting years for. Stop me if you’ve heard this one…Hamato Yoshi, master ninja and former member of the Foot Clan, is murdered, alongside his wife Tang Shen, by Oroku Saki, a.k.a The Shredder, in revenge for the accidental death of his brother. His pet rat Splinter is left to wander the streets until he happens upon a startling event. A truck carrying radioactive ooze swerves to avoid a blind man crossing the street, and the process a canister of the ooze flies off the truck and knocks a glass bowl of four baby turtles out of the hand of a young boy and washes alongside them down the sewers. Splinter follows and sees the canister has shattered and the baby turtles are covered in the strange mutagen. Splinter cleans them off, getting covered in the mutagen himself, and over a period of time, the five begin to mutate to become more human like in size and intelligence. Teaching them the secrets of ninjitsu he learned from mimicking Yoshi in his cage, Splinter names his new sons after great Renaissance artists and raises them to become the Teenage Mutant Ninja Turtles! That’s the original origin from the Mirage comics we’re all familiar with in some form or another. In order for this reboot to really stand on its own and be a fresh new start, the origin had to be revamped. Waltz and Eastman gave us a new origin that was even crazier than the last, but at the same time made a lot more sense and helped fill those gaps in logic the original glossed over. WARNING: THIS IS WHERE I GET INTO SOME HEAVY SPOILERS, SO IF YOU HAVEN’T READ THE COMICS, STOP READING THIS NOW AND GO PICK THEM UP YOU NUT! In the new story, we begin in Feudal era Japan with a man named Hamato Yoshi, elite ninja of the Foot Clan, one of the strongest and most feared ninja clans in Japan, led by Oroku Saki. Saki sought to establish the Foot Clan as a dominate super power by killing an entire village of people. Disgusted, Yoshi publically called out Saki and stormed off, cutting his ties with the Foot Clan. Enraged by Yoshi’s disrespect, Saki put a hit out on him and his entire family. That night, Foot ninjas attacked Yoshi’s home. Yoshi fought and slayed them, but not before they had killed his wife, Tang Shen. With her dying breath, Shen begged Yoshi to take their four young sons and flee, to which Yoshi complied. For years they had lived in relative secrecy and peace, but Saki, now going by The Shredder, hunted them down, and had them all executed, with Yoshi with his last breath vowing revenge, against Shredder. Over a century later, a young college student named April O’Neil is in the midst of an internship at the Stockgen Research Facility, run by Baxter Stockman. Unbeknownst to April, Stockgen’s experiments in bio-engineering meat are really a front for developing genetic and neurological weaponry for the mysterious General Kraang, reveled to be the last of a race of alien brain-like creatures called Utroms, who is waging a war in Dimension X. One night, while alone in the lab, April is attacked by two unknown, but familiar looking ninjas, who were there to steal the experimental mutagen, as well as the four experimental test turtles. April is saved, when the lab rat Splinter, sensing an aura of goodness around her, triggers the fire alarm which alerts security and forces the ninjas to flee, with Splinter in pursuit of the captive turtles, to whom he feels a strong, almost fatherly, connection to. Splinter manages to free the Turtles from the ninjas, and they, along with the canister of stolen mutagen, fall into the alleyway below, and are exposed to the radioactive ooze. It’s then that they are attacked by an alley cat. Splinter fights it off, even scratching out one of its eyes, but it runs off with one of the Turtles in tow. In a short period of time, the mutagen takes effect and Splinter and the Turtles are mutated to human-like form, and it becomes evident to Splinter that he is the reincarnation of Hamato Yoshi and the turtles are that of his sons. Like I said, crazier, but makes more sense. 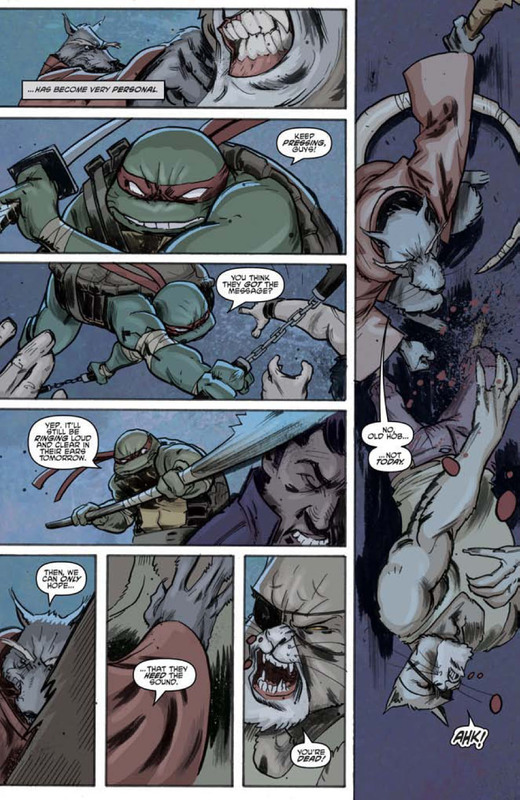 This new origin ties in many of the major characters and helps to make sense of some of the more head scratching bits of the Turtles mythology, like how Splinter knows so much about ninjitsu, and how the Turtles were able to learn in so quickly and seamlessly given their physiology. When I first read it I was blown away by how effective it is and how deeply it’s rooted in past Turtles lore. There are elements of both the comic and cartoons, but it’s not forced, rather the long hoped for hybrid of both incarnations. Like I said before, the characters are all familiar. Leonardo is still the stoic leader, but this time is a more spiritual and a lot more commanding. He’s still the most disciplined and remains close to Splinter, and having him be the only one of the Turtles with memories, albeit faint, of their past life was a great way to reinforce that. Donatello, like always is the brains of the bunch, with an added twist of having his more logical and rational thinking frequently coming into conflict with Splinter and Leo’s spirituality, but nonetheless he remains close to both. Michelangelo isn’t quite the hyperactive slacker he was in the cartoons, rather this time serving as the peacekeeper of the team, his youthful innocence helping to calm tensions between his brothers. As of the time of this writing, he’s been the Turtle that hasn’t received much development, but that will no doubt change soon. Raphael is still the hot-tempered loner, but this time his justified seeing as how prior to the start of the series, he had been separated from his family for over a year, giving him the feeling of an outsider. He’s also the Turtle with the strongest sense of justice, often rushing in head first to right any wrong doings he happens upon, a trait he shares with his best friend Casey Jones, who in this series is the Turtles first human friend (post-mutation). Casey in this new universe is younger, and is way more mellow than he’s been in the past, at times even being the voice of reason amongst the group. He’s in college thanks to hockey scholarship that’s in jeopardy due to his suffering academics. He’s the constant victim of physical abuse from his alcoholic father, and vents his frustration through his vigilante activity at night. And yes, he still wears the hockey mask. Master Splinter has seen some new elements to his history, his comic and cartoon origins being blended into one. This Splinter is less frail and more defensive of his family, having lost them before. We also learn of his past issues with controlling his anger, something that he feels indirectly caused the death of Tang Shen and his sons. This change really makes his character more three-dimensional, transforming him from a Yoda-like all knowing mentor, to a character who’s made mistakes and has learned from them, and imparts those morals onto his sons so they don’t suffer like he has. April O’Neil has pretty much remained the same as she was in the original comics and 2003 cartoon; she’s intelligent, compassionate, resourceful, and loyal. Having her be the one to name the Turtles was a nice little touch, too. But where would are heroes be without the villains? Shredder is back, and more threating than ever. He’s ruthless, conniving, and vindictive. He still retains the blood feud with Yoshi, but here it feels a lot more personal. There’s still a lot more left to be reveled with the character, so let’s look at the other main villain of the comic…Krang. Save for his appearance in the 2009 movie “Turtles Forever’, hadn’t been used since the 80’s/90’s cartoon. For the new series he’s been given a more menacing and deadly update, even combining his backstory with that of longtime TMNT characters The Utroms, and like them were indirectly responsible for the Turtles mutations. Old Hob is a new character to TMNT mythology. 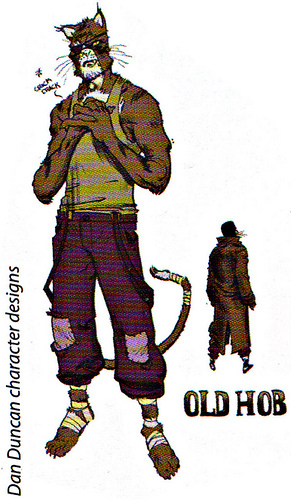 A mutant alley cat with a thug’s attitude, he serves as more a recurring nuisance to the Turtles rather than a looming threat like Shredder and Krang. Another new character is Allopex, a mutant artic fox that serves Shredder and the Foot Clan, and has a rivalry with Raphael. Her origin remains largely unrevealed as of yet. Other characters from past TMNT incarnations have made appearance in both major in minor roles. Karai and The Fugitoid from the original Mirage comics, Slash and General Tragg, from the original cartoon and Archie Comics, Angel and Silver Sentry from the 2003 series, and even beloved fan favorites Bebop and Rocksteady (unmutated…so far). This new series doesn’t seem to be shying away from any piece of the TMNT franchise, (except for Next Mutation of course), and that opens it up to endless possibilities and chances to see more past characters used like Leatherhead, the Triceratons, Hun, Lord Dregg, Agent Bishop, Tokka and Rahzar, Renet, Mondo Geko, the list goes on. Of course, they shouldn’t be discouraged from coming up with more new characters. They can only live of nostalgia for so long. Though, I’m keeping my fingers crossed for a new crossover with Usagi Yojimbo. Like the prior comic series, there’s a spin-off series of micro issues that serve to flesh out individual characters as well as set up new story elements. So far, each of the Turtles, Splinter, Casey, April, and the Fugioid have received focus, and each serves as a both great stand-alone read and essential for understanding things to come. Each one gives us a unique look on the perspective of the respective character in focus and takes care of the necessary character development so the main book can flow more smoothly. The art in the first twelve issues was handled by Dan Duncan and Ronda Pattison and it was gorgeous. Duncan’s were striking and fluid, like the Turtles themselves. Every panel had a strong sense of movement and he really knew how to stage a scene with the strongest angles possible. No exaggerated musculature here, the character designs were all simple and geometric. The look of the environments had a great grittiness to them and Pattison’s colors really highlighted that. I don’t know if they were done digitally, but I doubt it. The issues looked hand painted to me and added to the fluidity of the action. They characters were bright and stood out from the dark shadowy backgrounds. As of issue 13, Andy Kuhn has taken over at duties, and while not as dynamic as Duncan, he offers a unique and delightfully odd look that fits the tone of the TMNT. 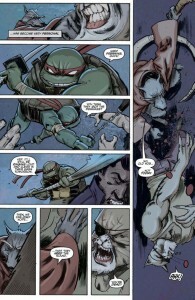 This new series is like an “Ultimate TMNT”. It takes what came before and molds it into a fresh new modern take we haven’t seen before. It uses nearly the entire franchise as building blocks, and as a result it’s hard to see where each storyline will lead. 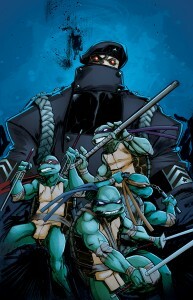 People know that TMNT has a comic series going again, and this is a great one to present them with. It satisfies older fans, intrigues newer fans, and has become one of IDW’s highest selling comic series. When everyone was up-in-arms about the Michael Bay TMNT movie, I was content in the knowledge that as long as I had this comic, I didn’t care what they did to the Turtles in the movie (then I read the script and thought otherwise, I’ll cover that later). This, to me, is the perfect TMNT…anything. It’s got everything I ever wanted out of the franchise and for a long time after it came out, I thought it couldn’t get any better. Next Time: The New Cartoon!